The intro shows a storm sky; the landscape is steeped in that air of grayness. Two young girls are being sold, body and soul, and will be ripped away from home and family forever. Doesn’t get more hopeless than that! See E.T. the Extraterrestrial, War Horse, Schindler’s List, Twister, Joe Vs. the Volcano, Twilight Zone the Movie Kick the can Episode, Poltergeist for other Spielberg films that employ monotones to invoke despair. As they arrive in the city, the first colors begin to shine through the gloom: red and yellow lanterns. Watch as other sights and costumes in the beginning sequences showcase the same tints. See Jaws, Sugarland Express, 1941, Jurassic Park, the Goonies, Indiana Jones and the Temple of Doom, Schindler’s List, Twister, Joe Vs. the Volcano, Duel, Used Cars, Inner Space, Poltergeist. Picasso had a blue period…but red and yellow are a classic palette signature Steven has adopted straight from the WOO Technicolor artists. Steven’s fingerprints are all over the scene where the girls go to Geisha school with bicycles interspersed among the rickshaws. Later, Mameha’s test of Sayuri’s blossoming Geisha skill is to stop man in his tracks with one look. With a demure glance, Sayuri crashes a young man on his bike. See E.T., Munich, Adventures of Tintin, Amistad, 1941, Always, Super 8, War of the Worlds, Empire of the Sun,The Goonies, Sugarland Express, Jaws, Inner Space, Used Cars, Poltergeist. Like Hitch used his distinctive body form, Steven uses his bike as a hallmark of his involvement. Snow falls. The chairman notices blue-eyed Chiyo is a slave. 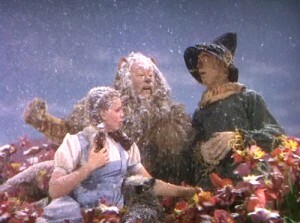 Glinda’s snow banishes poison in WOO and does so again here. See War Horse. Chiyo will get a chance to escape the misery. The chairman sends Mameha to mentor the girl. To emphasize this change in Chiyo’s fate, bells ring. You hear a faint tinkling when Sayuri talks with the baron at her debut. He will play an important role in her future. When Pumpkin tells Sayuri about Hatsumomo deceiving the doctor with gossip, another bell rings announcing the catastrophe and its remedy. At Sayuri’s lowest point, feeling worthless after the Baron’s unkind treatment, the bell rings again. Not worthless after all, it turns out she will fetch the highest price ever known. See Always, A.I., E. T. ,The Color Purple, Jaws, Close Encounters, Empire of the Sun, Super 8, Twister, Twilight Zone, Joe vs. the Volcano, Poltergeist for other examples of WOO’s foreshadowing chimes that clued us Glinda’s magic was imminent. Did the little dog barking at Chiyo as she attempts her rooftop escape remind you of Toto?